Have you heard about this new groundbreaking documentary? 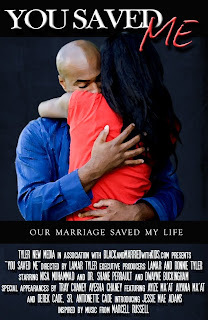 "You Saved Me" was created by Essence bloggers and the creators of BlackandMarriedWithKids.com Lamar and Ronnie Tyler. It features African-American couples and the greatest love stories ever told. You Saved Me is the the follow-up film to their best selling debut Happily Ever After: A Positive Image of Black Marriage. Now here is the best part: Lamar and Ronnie are great supporters of our site and they are giving away two copies of their new movie to TWO of our readers. Just leave a comment to be entered in the giveaway. Winners will be determined using a random generator so join in. This documentary is going to be important for years to come! Now this weekend the movie will premiere in over 25 cities, so check here for listings. Find the trailer below. Well that is just awesome! I hope I win! I've been planning on ordering this movie. Please sign me up. I would love to win a copy! Thanks for this giveaway! Hey there!!! I just discovered this slew of amazing blogs (yours being one of them!!)! Thank you for the giveaway and the amazingly wonderful effort you put into this website! I definitely spent about 3 hours going from today all the way back to the beginning of this blog reading EVERYTHING!! I hope I can win the DVD!! Alright, ladies! The winners have been chosen by Random.org. Wordless Wednesday: Hello? Yes, We Did It!